The science of interacting surfaces in relative motion, including friction, lubrication, and wear. Combining fundamental Tribology knowledge with a deep understanding of the design and operation of machine components. We apply Tribology to investigate machinery problems and failures. Discover why Tribology expertise can ensure machines operate safely and reliably - and how we can solve your next machinery problem. We regularly do Design Audits to assess ''fitness for purpose'' of mechanical designs - helping to prevent future failure and malfunction. We use Engineering Tribology know-how coupled with first-principle analysis to ensure machine reliability. We have over 50 years of experience in diagnosing and mechanical and tribological failures in all industries and in any part of the world. These include: bearing failures, gear failures, seal failures, and any problems involving the moving parts of machinery. We have distilled our extensive experience of machine operation and mechanical failure analysis into books and technical articles. These are used by Mechanical Engineers as reference texts for the design and analysis of machine elements including bearings, gears and seals. We act as engineering expert witnesses for litigation purposes, where we deliver authoritative and unbiased opinion. Most cases involve failures of machinery and we also deal with Patent disputes and project disputes. We regularly do detailed engineering analyses of machine elements, bearings and structures. Our analysis capability complements our Tribological understanding and our practical knowledge of machinery design and operation. We carry out assignments all over the world. When appropriate we work remotely for economy, but frequently we travel to international locations to investigate and inspect, or to present our findings or give expert evidence in court hearings. 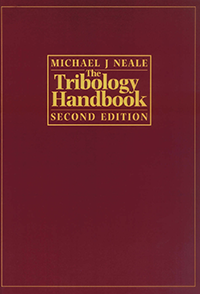 Ever since it was first published 20 years ago, The Tribology Handbook has been a reference ''Bible'' for engineers the world over. It gives instant access to essential information on the selection, design and performance of Tribological components, including their practical limitations, and failure modes and causes. It is primarily aimed at designers and engineers in industry. Additionally, operators of machines should find the book extremely helpful, because it provides an atlas of component performance, invaluable for maintenance and troubleshooting. The Tribology Handbook is published by Elsevier. ISBN 0 7506 1198 7. It can also be purchased from Amazon We are pleased to be able share selected pages here . Neale Consulting Engineers Ltd. provides impartial advice and has no ties to manufacturing companies. We aim to complement the expertise and knowledge that our clients have in-house, and we work closely with the client. Our opinion is accepted internationally by companies, courts of law and governments. Neale Consulting Engineers have acted as Expert Witness in many international legal cases. We work for organisations that seek an un-biased opinion. Neale Consulting Engineers offer rapid response for failure and wear investigations. Usually we can mobilise an inspector or investigator within 24 hours for urgent matters.